Coleman DayTripper Beach Shade serves as the best beach canopy for those who want to enjoy their time on seashore with its full leisure, pleasure and privacy. With 7.5’ by 4.5’ size, this product comes with 2 doors that can be zipped closed in order to get complete privacy and allow you to get best of a completely private and comfortable place. Moreover, it allows you to change your wet swimsuit inside the tent hence beats the hazard of running around the stalls of a sickening public lavatory. With 4 ft. 9 in. center height, the tent can be an ideal shelter for any picnic on the beach or sidelines. Without holding it anymore, let us begin with our Coleman DayTripper Beach Shade Review. In addition to provide you privacy on the beach, Coleman DayTripper Beach Shade provides you the UV Guard SPF 50+ protection which is the best to house your young kids for a nap or even accommodate you for relaxing and enjoying a good novel. This beach canopy has three poles which can slide into sleeves to help you with an easy and quick 10-minute set up. While, its three poles may seem concerning to you, there is indeed nothing difficult or demanding about it. Some people may not find it as easy-to-install as a pop-up design but the tent is a pole style porch, and provides you a steadier set up.In 2017 it’s one of the best Coleman Tents so far. The best part of this special beach tent by Colman is that it isn’t expensive hence attracts more customers who love to enjoy their privacy with their personal shelter. Moreover, it comes with a small carrying bag, a floor mat, and a few sandbags. Also, it includes a drying line that allows you to hang your wet clothes and towels on it hence you can avoid laying your wet stuff on the sand or balling them up in a cloth bag. In short, Coleman DayTripper Beach Shade tent is known for its quality material, basic shelter features and worthwhile usage which make this product the most excellent baby beach canopy. When it comes to enjoy fun moments on the beach in addition to avail maximum privacy and comfortable shelter, nothing beats the features Coleman DayTripper offers. It has a wide awning on front side which is perfect for extra shade. Also, it has a privacy door which comes handy for changing your wet clothes. Its sandbags are provided to keep the shelter in place. Additionally, this versatile tent has an UVGuard material aims at providing you the highest protection from dangerous sun rays. Its back can be converted into a mesh door or window and a wall. Coleman DayTripper Beach Shade is a portable canopy that is designed to offer the best privacy and shade when you are on the beach or spending hours on the sidelines. It has a versatile back that can easily covert into a wall, door or net window. It helps you avoid going to public restroom for changing your swimsuits or other clothes. The tent comes with a front awning that is perfect for extra shade. 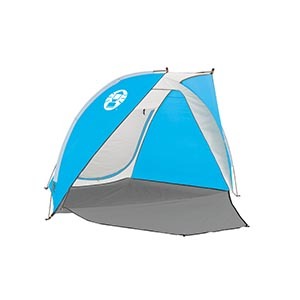 It may not come with an easy set up as you find with many pop up tent designs available in the market. However, it is a pole-styled canopy which does offer a more stable set up. The product includes limited time period warranty that goes up to 12 months after the purchase. With all these features and economical price, you will want to get and we would recommend you as well however, as mentioned in the review, if you are going to face weather conditions not normal, just leave the idea.